I have a 2013 GT. This week my bike developed an issue where it doesn't start in any gear, only in neutral. Kick stand fully upright. Once its started I can pop it into gear and take off, I've always been able to start it in 1st gear. I can even hold the ignition switch while its in first then pop it up into neutral and it starts immediately. What am I missing? I know I'm not crazy, I've started it in gear before..
2017 KTM Super Adventure R, 2013 BMW K1600GT, 2015 BMW R1200GSA, 2008 KTM Superduke, 2008 DRZ 400SM, 2008 Suzuki GSX650F. That would make sense. In neutral the bike doesn't need the clutch pulled. Thanks for the information! If you've changed the levers to adjustable ones trying adjusting it away from the bars. It's possible that the pull isn't long enough to engage the safety switch. Its has the original levers, nothings changed. When the lever is pulled in and let out I can hear the switch click. Nothing has changed with this clutch lever at all. I'll bring it by the deal tomorrow and see what they say. If you ride the bike and put the cruise on, pulling in the clutch should drop out the cruise, if not you know it is the clutch switch. It may be the side stand switch. I have the same problem. It started intermittently, but now it is solid - good!. It always started when put in Neutral. I have stock levers and adjusting doesn't help and I can hear the switch clicking when I pull the lever slightly. The switch itself doesn't have much play for adjustment. It has a little locator pin and small screw. I took it off and it is a sealed unit, so not going to mess with it. 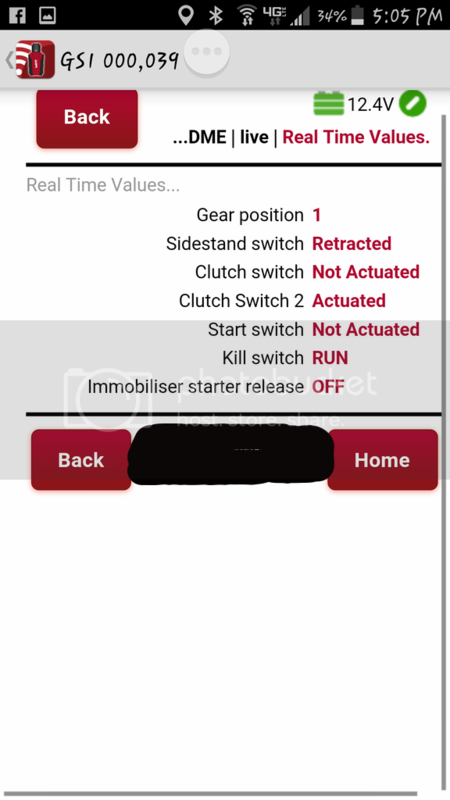 I hooked up my GS-911 and it is interesting that it shows the position for two clutch switches. I am guessing one is for canceling cruise control and the other is for preventing starting in gear without clutch disengaged. Screen shot of the GS-911 screen showing positions of all the relevant switches. This is with the lever pulled. Switch 2 changes fine when I pull the lever, so that must be the cruise control and I have no problem canceling that. Oh well, looks like a trip to the dealer and test the coverage on the extended warranty (I have 40K on the bike) . It is a $55 part, but a tank of gas and a day to ride down to my nearest dealer, BMW Ventura. Old thread but no one came back to post their resolution. I have the same problem but I may have done this to myself. Yesterday, I installed an Autoswitch (likely the wrong model for this bike). After connecting the Autoswitch controller wire to the black wire on the clutch switch my garage door opened, but only once. Since then the bike will only start in neutral. Once started, I can put it into gear and it continues to run. If I drop the sidestand while in gear the engine is killed. Although I don't have a before measurement, I have noticed a constant 12v on that black wire and it is not affected by the clutch lever position. Worried I might have damaged more than the clutch switch. Last edited by smahon; 02-10-2019 at 06:16 PM.